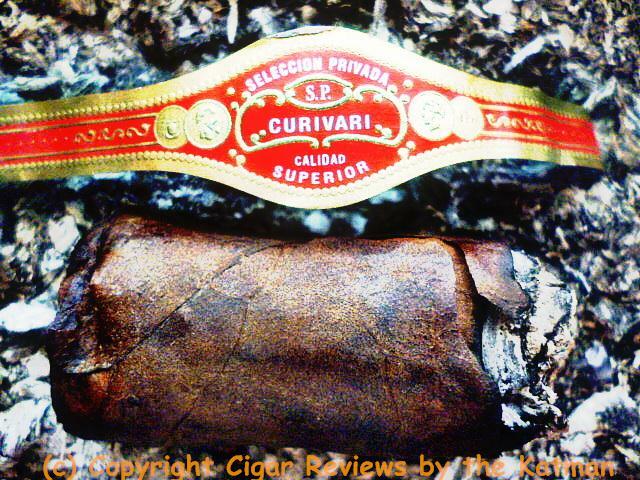 Curivari is a relatively new cigar company whose sole purpose is to make cigars that are as close to Cubans as possible: blends, the look, flavor, etc. 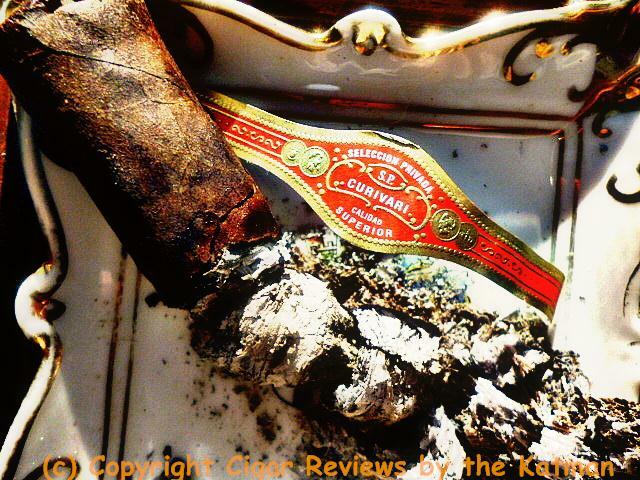 Even the cigar band looks like the Cuban Partagas band. Yet, minus the traditional Cuban pig tail cap. 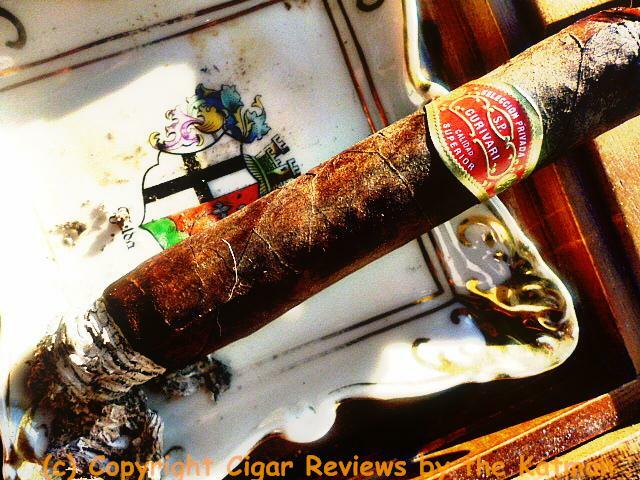 The web site says it uses Authentic Cuban Seed Criollo and Corojo but where? Binder, filler? 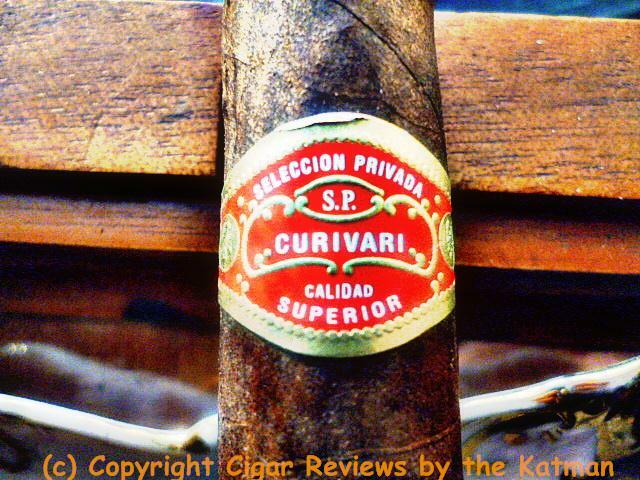 Mine was gifted to me by follower Bobby C.
It was at the 2010 IPCPR trade show that Curivari announced the addition of the Selección Privada line. 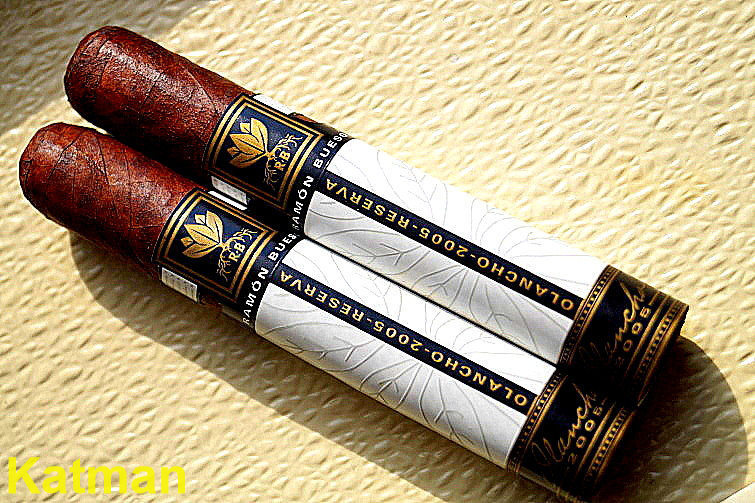 The Natural line came first and then in 2011, came the maduro. 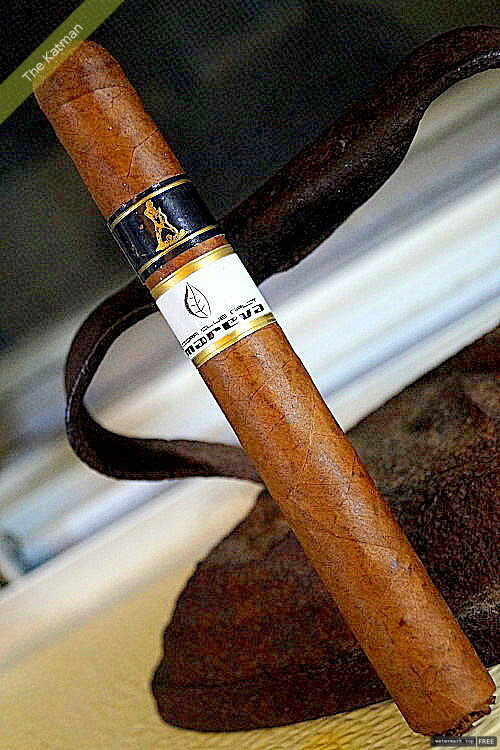 The Reserva Limitada is the only other blend that comes with a maduro wrapper. The cigars only come in boxes of 10. Construction is on the rustic side with exposed seams, loads of veins, bumps, and rolling issues. The very dark, oily wrapper hides most of these flaws but will be unveiled in the light of day. And the wrapper feels toothy in places. 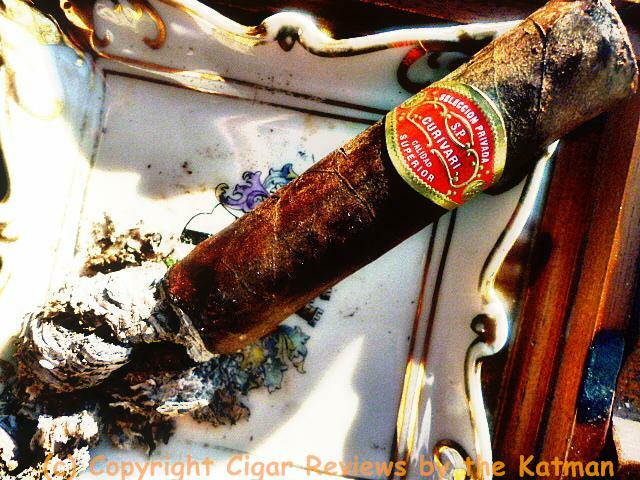 I clip the cap and find aromas of earthiness, spice, sweetness, hickory wood, nuts, cocoa, and toasty. The first puffs are woody and spicy. The draw is very good. And then flavors begin to show themselves starting with cocoa, cedar, sweetness, nuts, and that hickory wood aroma finds itself in the background of the flavor profile; and lastly: cinnamon. A lot of flavors right up front. The spiciness is red pepper and is potent enough to make my nose and eyes water…and tingle the tip of my tongue. At the first half inch, the char line is excellent. At the first half of the first third is a boat load of subtle flavors all taking turns at being up front but nothing is organized yet. Sort of a free for all. And there is a tad bit of harshness to the stick at this early point. 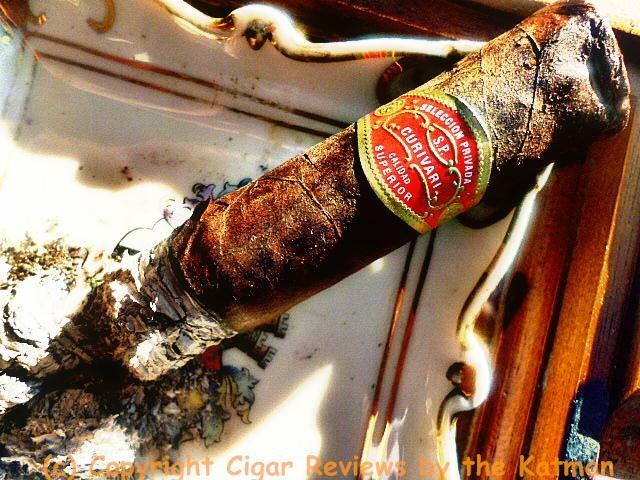 The cigar’s strength is classic medium bodied. Creaminess appears. This is a slow burning cigar and I’m only approaching the second third after 25 minutes. Flavors begin to get in line and become more refined. The sweetness is a comer. Adding to that, is a honey element trying to break loose of its constraints. The cocoa is very strong but not even keeled yet. And as the first third fades away, I get some lovely floral notes. The beginning of the second third sees the harshness disappear. Flavors become more defined. In order of boldness: Sweetness, spice, cocoa, creaminess, honey, hickory, nuts, and cedar. It seems that the stick has made a dramatic turnaround from the first third. Just like about everywhere else, the weather is cold and frigid. It is currently 10 below and I sit in the dining room with the window wide open to ventilate. I should get a Snuggie. Complexity finally begins to assemble. 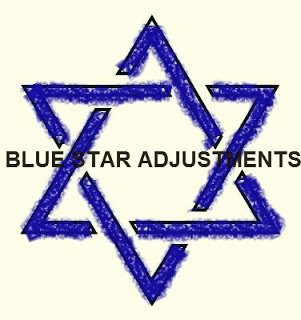 Flavors are well defined but there is a rich earthiness holding them together in a tight circle. Flavors make a gentle change from one to another. It is not going to be a flavor bomb my instincts tell me. But a good solid cigar. The price point is about right. Definitely better than a $4-$5 stick. I’m at the halfway point and the stick decides this is the place to blossom. The red pepper comes back with a real punch. The sweetness, honey, and creaminess are strong and defined. The cocoa and hickory are terrific. But the floral notes have disappeared. 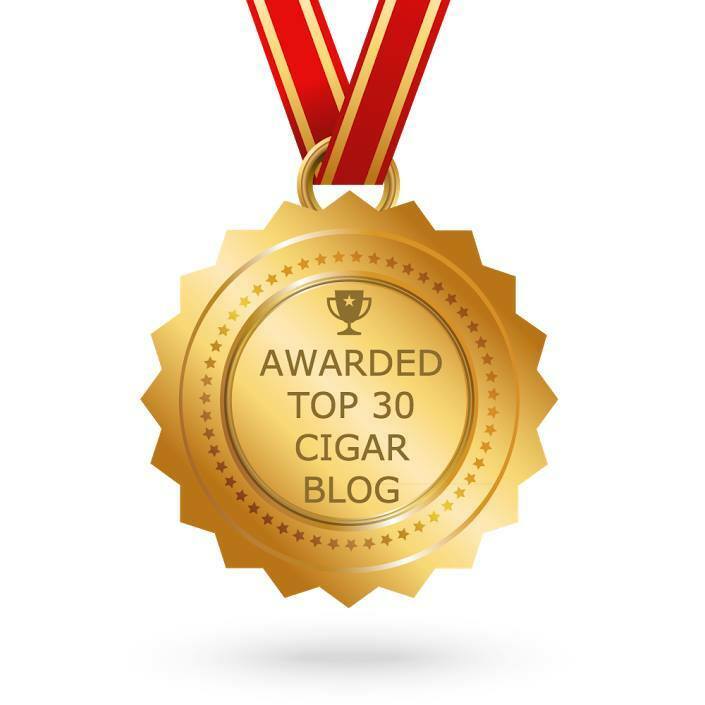 To put it plainly, this is a yummy cigar. Earthiness is the bedrock from which the other flavors find root. I would definitely buy this stick. And many thanks to my friend, Bobby C. for sending me some samples. Another flavor reappears. It is cinnamon. 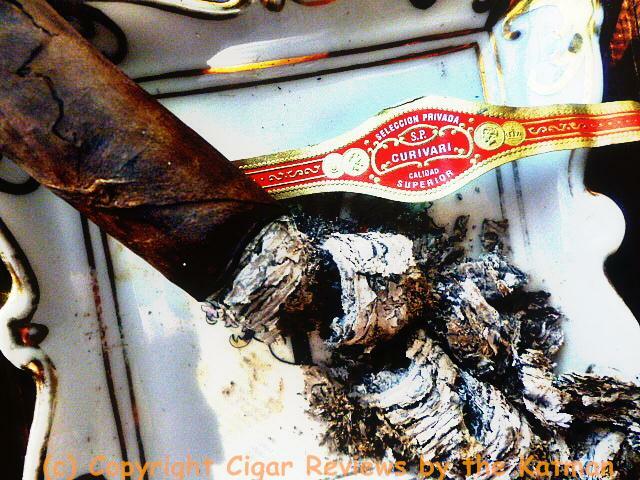 It was buried in the early part of the cigar. But now, is nicely rounded out and spicy. Cedar also finds its place amongst the other flavors. The last third begins with a nice surprise of caramel. It brings out a peanut flavor that matches its intensity. A candy bar of sorts. 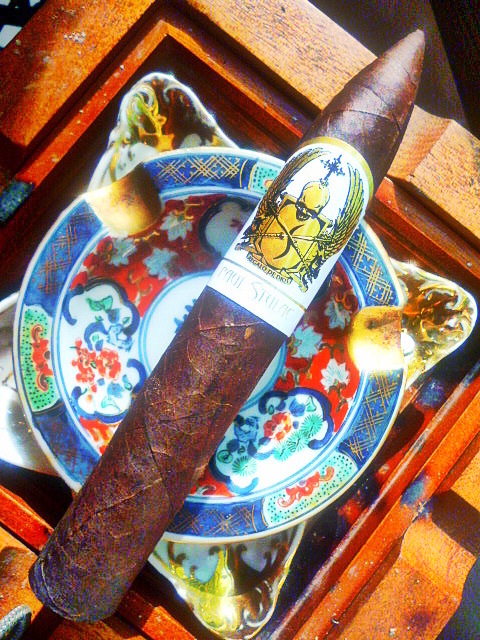 The strength remains at classic medium without an iota of nicotine in sight. The char line has not required a single touch up. 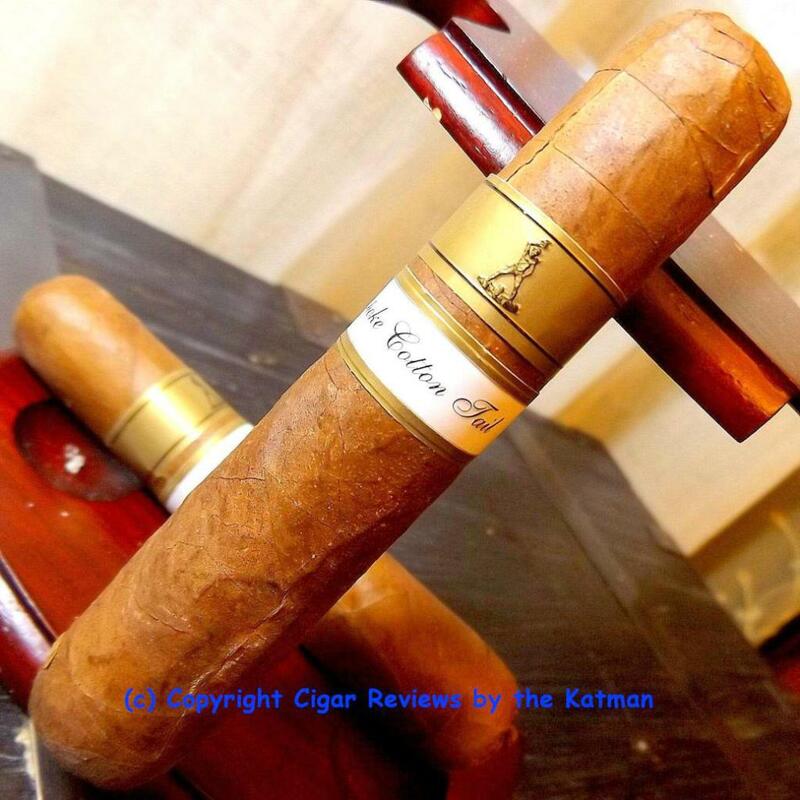 While flavors are distinct and interesting, the stick never quite reaches flavor bomb status. Maybe 3 weeks is not enough humidor time. And since I haven’t had a Cuban in some time, I am at a loss to compare it. Sorry. Someone send me some Cubans. This poor church mouse can’t afford them. With a couple inches to go, the burn line needs its first minor touch up. More for photos than true need. I find myself eating my own words now as those last couple inches do reach a flavor bomb rating. Time for the cigar band to come off. Easy Peasey. Some cracks begin to show near the cap. But no glue required. 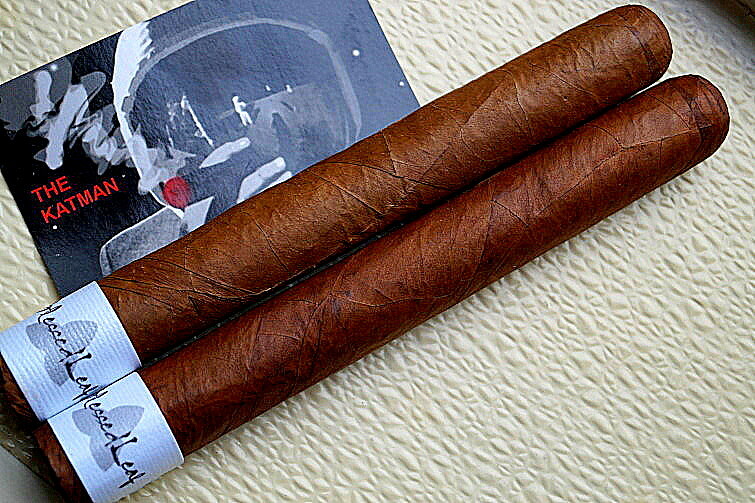 The cigar finishes out a little stronger than medium body. 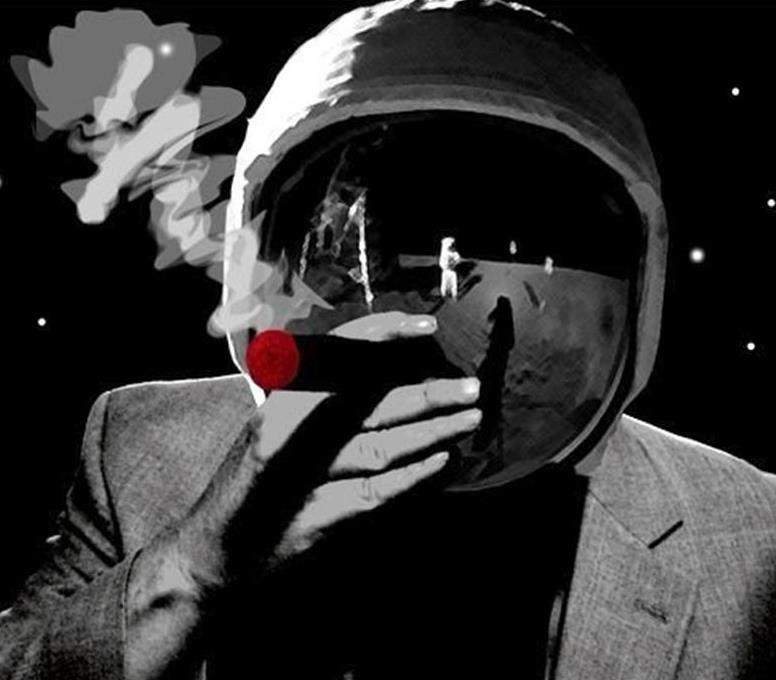 A small amount of nicotine arrives but not enough to make me go blind. 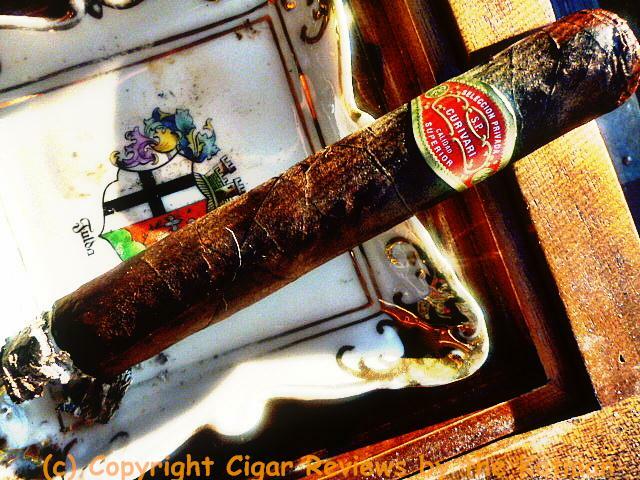 I recommend this cigar because it is a solid, well-made cigar with interesting flavors and a nice complexity. 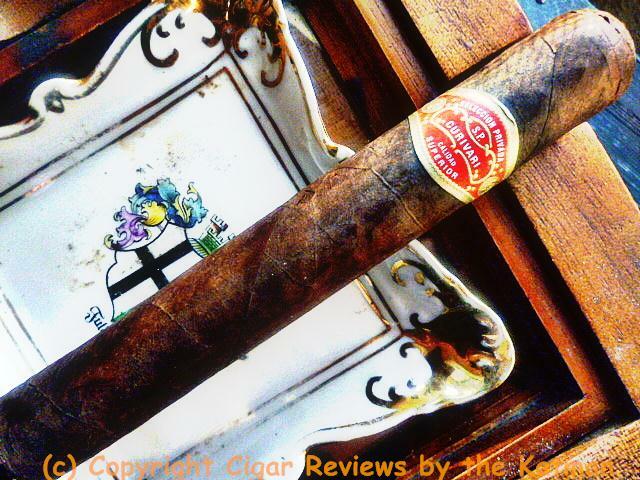 It has a nice long finish and was just a pleasure to smoke.